Zodiac's Pool Link provides cost effective timing functions in an easy to wire module that can be added to any AquaLink RS Power Center providing basic automation. Dual timers provide you with the operational features you’ll need for a single speed filter pump plus a cleaner booster pump, in-floor cleaning system or two-speed pump operation. Dual circuit control will provide the functionality needed to keep the water flowing and your pool sparkling clean. Simple to install and operate, the Pool Link is perfect for basic automation and easily upgraded later to any AquaLink RS advanced control system. 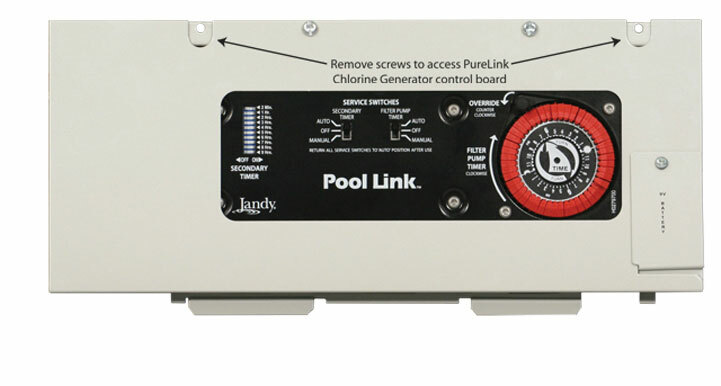 A clean pool is guaranteed with the Pool Link Dual Timer Module. Let the Pool Link automate the filter pump, automatic pool cleaner cycles and in-floor cleaning systems for efficient and safe operation of your pool equipment. The Pool Link’s primary time clock is activated by standard pull-to-trip tabs, providing your daily automation of filtration cycles. If you are looking to keep your energy bills down, set your filtration cycle to activate during non-peak hours. Each pulled tab represents 30 minutes of pump activation, so you can set your filtration cycles for when you want and however long you need. Rest assured that, each and every day, the Pool Link will keep your pool sparkling clean. With the addition of a JVA, this system will also automate an in-floor cleaning system by rotating the JVA every 20 minutes. 24-hour primary timer automates start and stop times of a single speed pump or two-speed pump and in-floor system. Secondary timer automates operation of a cleaner booster pump or two-speed filtration pump, with a simple DIP switch setting. Conveniently located services switches allow three modes, “Manual”, “Off’, or “Auto Mode” for ease of operation and maintenance of the pool. Includes Power center PCB with two time clocks, control of in-floor JVA, heater control with built-in cool down, adjustable freeze protection, plus override time clock switches.